Here’s your latest interview with 8th place winner John Macris from the 13th Adonis Golden Ratio Transformation Contest. There’s quite a saga to this, so readers are welcome to scroll forward! You know when you’re looking through your old CD or album collection (well for those people old enough to have owned music in an actual physical medium)… you find some artist or band that you once followed a long time ago and now when you revisit their music you’re like dumbfounded and saying “jeez what was I thinking?! That’s just embarrassing”. Well, my back-story of attempts at shaping a decent physique kind of evokes the same reaction from me now. I’d say even though I now feel kind of like I was an Adonis Golden Ratio (AGR) Systems user waiting to happen, the journey here was pretty random and meandering. Growing up, fitness-wise I was either completely average or maybe a little behind the average. I certainly never rated as lean in that I carried a little paunch around the waist and softness in the chest, and I didn’t have any sporting talents to speak of. That same physique basically persisted into my early 20s along with the usual filling-out associated with reaching adulthood. I did have a fairly physical job during almost a decade from age 19 to 28 and I’d estimate I probably acquired a bit of muscle mass through the core and legs associated with that job’s lifting duties. But I did minimal actual purposeful resistance training until I was nearly 30. My first taste of taking on a routine of exercising and some degree of food…discipline (I wouldn’t call it dieting)…was when I was around 26-27, I started doing a late evening jog and reappraised a couple of my typical snack choices. That was important, in that it showed me I could make an appreciable difference to how I looked just through being in the habit of exercising and thinking about what I ate. I was also dabbling in vegetarianism, which in hindsight probably helped weed out a few calorie-dense snack foods from my weekly menu. Then I became an undergrad and then postgrad student for a good number of years at one of the universities here in Sydney. With that, my living location changed and I lost the knack of regular exercise for a while. But ultimately I gravitated back into a routine and joined my university’s gym in about 2000. Since then, I estimate I’ve only had maybe one gap of a few months of not exercising. Otherwise I’ve been going to the gym 4-7 times a week. For a while I was seduced by what the mainstream male fitness magazines of that time were continually preaching to their readers about using weight training and muscle hypertrophy as a secret weapon to make you metabolize all your surplus fat. I arrived at a skeptical view on that after seeing how ineffectual it was as a strategy for getting leaner. Or maybe I still took it on faith, but I thought my own body was malfunctioning. Then right in the middle of my 30s I turned back to cardio, this time having caught the intervals craze, and used a treadmill every morning before breakfast. I did tighten up on my snacking at the same time without really thinking too hard about it. Six months of that approach got me to the leanest I’d been up to that point. I know that because I was taking weekly waist measurements and weighing myself, and I got down from a 38 plus to a 34.5 inch waist, and landed at around 175 pounds. I subsequently found a regular gym buddy who was naturally lean with no effort involved, and who was keen to do weight training with me every day. To fit with his habits, I just stopped worrying about my waistline and we both went on a “Get Strong or Die Trying” campaign. It became like the only metric I was thinking about was how many plates I could put on the bar, and I came to believe some spiel that one of the supplement companies promoted in their magazine about all the effective muscle growth coming from lifting in the 4-6 rep range. In that little realm of broscience, anything of higher reps supposedly offered you nothing besides a warm-up. That’s one of my big cringe episodes now. I think I found my absolute worst look ever on that regime. My goals had been soundly hijacked, not to mention I was wasting my meager student income on an array of supplements. I’d liken the physique results to looking like a barrel all through the torso and core, coupled with underdeveloped arms and shoulders. I weighed about 200 pounds and had a 39 inch waist. So I got dissatisfied or bored with that after three or so years and various inflamed tendons and joints. Since I had no new hypertrophy bandwagon to jump on, I just started experimenting with new ways to lose weight. I took up swimming multiple times a week, added back in some treadmill and stair machines, once again at the fairly high intensity settings, and got maybe two weight training sessions a week where I trained pretty much only back and shoulders. As I had almost no dieting discipline over that period, most of the workout routines didn’t really show up as visible results on my body shape. I was just kind of spinning my wheels really. In 2011, I had one of my wishful, greener-pasture moments that actually set me on the path ultimately to here. And amusingly, it was really just as ill-informed as any of the earlier ones, but happenstance made it work out. What occurred was I saw someone using a skipping rope at the gym and thought “hey, everyone I’ve ever seen who was really proficient with one of those things was also ripped and well proportioned”. It didn’t occur to me that maybe it was the fact they were ripped and agile that made skipping a skill they were good at, rather than my assumption of the activity itself having transformed them. So I ran off to buy a cheap skipping rope and googled a few terms pertaining to it. And like quite a few of your early contest winners, my web search took me to that Fitness Black Book blog that seemed to have a big following, I assume because he was a) filling a niche that the bodybuilding websites were ignoring, and b) he probably had optimized it to come up on lots of people’s web searches. I caught some of Brad Pilon’s and Adonis’s material via that blog. I think I’d always had some intuition that there would a sweet spot that captured both leanness and some degree of muscle mass, but this was one of the first programs that seemed to start with that as the basis for everything else that follows. The first thing I did to dip a toe in the water of this lifestyle as it were and have it grow in appeal, is experiment with fasting. I totally surprised myself that I could even make it from dinner to lunch on my first attempt. And I was hitting 24 hours regularly within a month. That was June 2011. 4 months later I’d equalled my previous leanest waistline of 34 inches (I even gave fasting the actual credit, ahead of my seldom-used skipping rope). 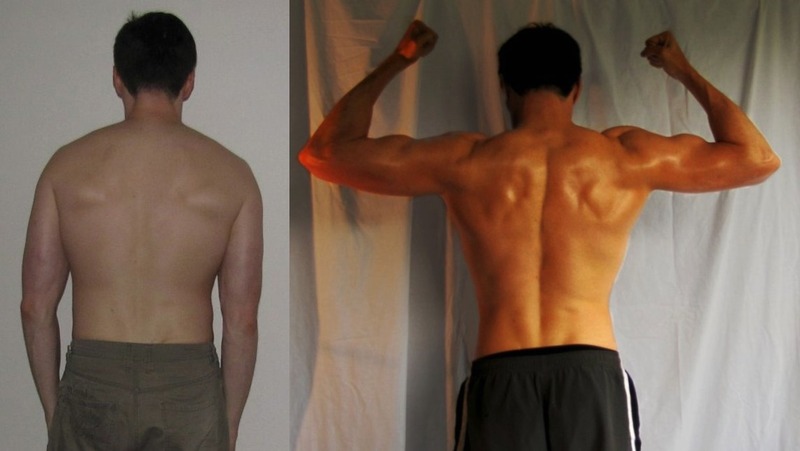 At the time I initially got into fasting, I did look at Adonis programs and offers. But I think because I’d never actually been on a fully structured program before, I didn’t really appreciate what I might get out of it. Also, when your online calculator told me that at around six feet tall I needed about a 32 inch waist and almost 52 inch shoulders, I remember seriously doubting that I was made of the right stuff to get into that kind of shape. So I actually went on doing my own thing for another year, with ups and downs in the waist line and small changes elsewhere on the body. Fasting certainly helped curb things from ever getting too disastrous. 5- When did you decide to jump on board full fledge with AGR? I at last came to Adonis in mid 2012 after having bought Brad Pilon’s two original books and listened to his supplementary podcasts. I also caught a couple of your free podcasts, and that excerpt from the Starvation Mode one that was floating around. I was definitely getting intrigued about the systems here by that point. Brad sent around an email to his ESE customers with some links to workout programs he recommended, one of them being Adonis. And that almost resulted in another fail because after hitting purchase I discovered I’d only bought the Ideal Proportions eBook rather than the program. But I got past that once I saw the impressive tone of discussions in the forums – kudos to the members and moderators on that by the way. I then bought an actual program and jumped on to what was the current (AT9) contest. And ever since then, I’ve been slowly but surely developing my physique using your systems, and quietly doing contests to spur me forwards. I joined the contest that began a month or so after I first signed up. The contests seem like a lens to put things into sharper focus for what you need to be doing, and how consistently you need to be doing it. I think it would only be lingering self doubt that might turn someone off trying out a contest of this kind, as it’s really just yourself you’re making a commitment to. I was working to a weekly calorie target based on the AGR nutrition calculator, in effect a modest reverse taper across the 12 weeks. Increased meal spacing was probably my most versatile and frequent tool. There’s a point at which fasting just becomes calorie back-loading – i.e. you break your fast and eat most of the way back up to maintenance calories. But if you make that into a regular routine, then whether or not you score a big deficit for the day, you’re still on a trajectory to win the week. On top of the calorie back-loading approach, once a week I did a more disciplined type of fast, where I ensured that day would yield a solid dent in my weekly energy intake. 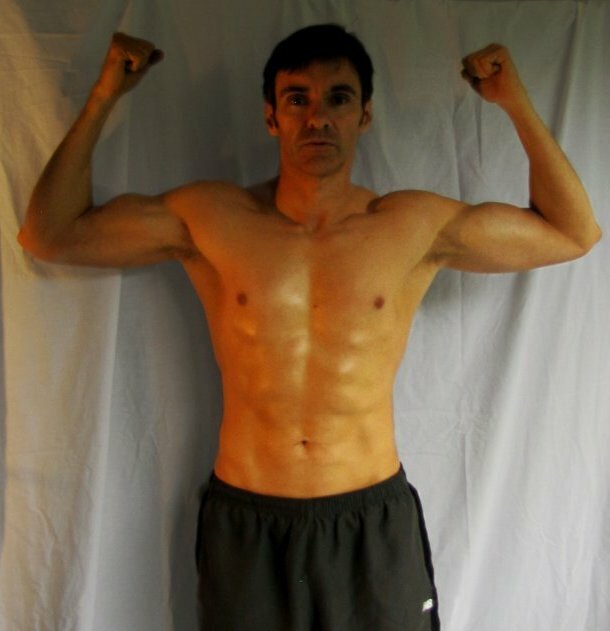 The week of the photo shoot I did just 2 days in total of carbohydrate and water manipulation. There weren’t really any completely off-limits foods during the contest, though I skipped a couple of social eating opportunities at critical times. I aimed to get at least six full Adonis workouts completed each week, i.e. run a little ahead of the program schedule. As it happened, I was coming to the end of my second time through the Category 3 program in the first couple of weeks of this contest. I then worked my way through the advanced growth modules, but with emphasis on the upper body routines. In place of some of the leg routines from those programs, I used the advanced shoulder modules, and also added in a bit more direct arm work courtesy of some of the superset weeks from the Adonis Gauntlet program. That’s a mixed bag of training modules I realise! But I can’t knock the progress, as this was the first period of training where my shoulder circumference would creep right up towards the magic golden AI threshold from time to time. As I still have quite a soft spot for cardio, and I find that when done at the right time of day it actually adds to my diet discipline, I did up to three sessions of treadmill running per week. If you believe the machine readouts, they were in somewhere the 400-600 calorie expenditure range typically. And I went out for walks quite frequently in the evenings as it was nice Summer weather down here in the southern hemisphere during the contest. There was only one case of over-doing something: I had a careless descent while doing reverse grip chin ups mid way through the contest and that resulted in recurring tendon pain in one forearm right up near the elbow during certain movements for a few weeks afterwards. There was usually a work-around if it seriously impinged on a particular exercise. 8- How did people react to your transformation? Positives and negatives (if any). 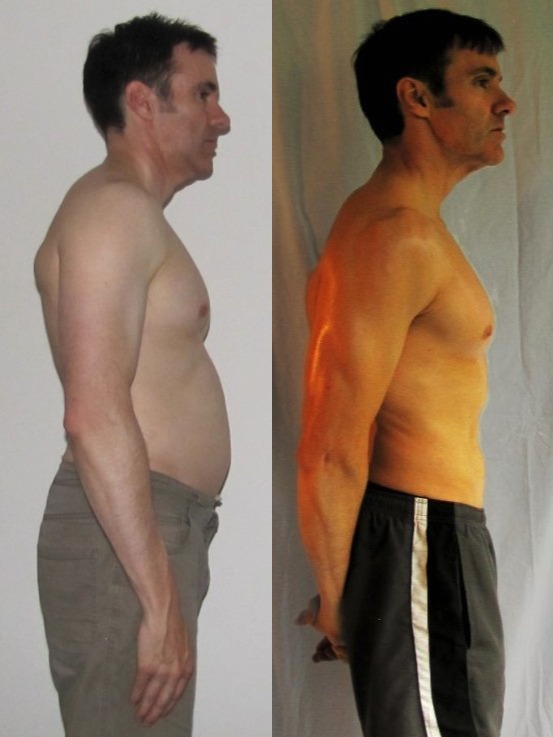 I’ll reflect here based on the longer period that I’ve been getting results with your systems, rather than just the 12 week transformation contest. It can be a gap of several weeks between each catch-up with my family. So they did have some startled/borderline concern moments early in the period where I’d dropped some serious inches around the waist and gotten leaner in the face. What’s interesting as an experiment in social attitudes, is that right as my waist circumference first crossed into territory regarded in health stats publications as indicating optimal low risk category for ‘western lifestyle’ diseases (a measurement of sub 50% of my height), that same level of leanness started generating comments along the lines of ‘is your health ok? You seem to have lost too much weight’. I’m thinking, based on this observation, that social norms have gotten regrettably out of sync with health indicators somewhere along the line. On photo shoot weekend I was kind of distracted by the circumstances. I’d tried to line up a shoot with a photographer who seemed like he knew how to do male physique shots, but he was moving studios at the time and our Plan B of taking them outdoors got rained out. So I reverted to taking my own pics at home. At least this meant I could time it ensure a decent balance between a dry/tight look and some degree of pump. But yes – I thought from the pics submitted that I had made a pleasing change, which is what the tape measure had already been indicating slowly across the prior weeks. In these last series of reflections, I’ll specifically reach out here to those who are like I was on arrival in 2012. In other words you’re not new to resistance training, with past episodes of goal-hijacking under your belt, and a bit unsure if you could really use this system to achieve something significantly better than you’ve managed before. Firstly, although faith is a popular term in describing how to apply yourself to a training regime, I’m going to avoid it as it’s not where my headspace was ever really at during my own transformations. You want to rely on types of motivation that won’t fall over just because you’ve experienced a lapse in that faith. So having heard similar advice to that numerous times over in past transformation interviews, many of you probably want to know what are some ‘life-hacks’ that keep you on-program, consistent and patient? Be sure to keep track of, and give yourself credit for where you’ve already made it to. Doing this is your springboard for where you want to get to next. Especially once your AI ratio is climbing through 1.4s and upward, remind yourself that you are already wearing really quite an impressive and fit-looking physique – think of this as akin to trying an outfit on, and enjoy each phase of your evolving look. Remember where you started from. With me as an example, although my tracker feature only goes back through about half the period that I’ve been doing Adonis programs, the trend is pretty clear. I’ve got that whole ‘decreasing sine wave’ thing going on, with shifting waist measurements gradually coming to float right around my ideal. The biggest compliment I can pay to this system is that my new ‘sine wave’ doesn’t even overlap with the range that it used to move within across the previous almost dozen years of continuous gym attendance. In simpler language, that means the biggest my waistline reaches these days – when my little internal alarm is going off to tell me to intervene – is still below what used to be a personal best in getting lean on anything else I’d previously tried. So that’s seismic and I really wish I could send a message back in time to the me that looked at Adonis’s online calculator teaser and doubted he could ever get close to a 32 inch waist and give him an empowering slap and say “Enough with the equivocating, just get on with it!” . Similarly with the workouts, I’ve added mass where I actually wanted to, often within a weekly calorie deficit regime. Two years of cycling through the workouts here with few breaks has acquired me with a couple of extra inches of lean mass on the arms and around the shoulders. I should also mention I’m lifting at never more than 75% of the max weights I used to heave up in the air during that misguided training period in my late 30s. We’ll still always get those ‘greener pastures’ twinges of glancing over at the somewhat more fit person at our gym and wanting what they have. I’ve found you can counterbalance that to a decent extent by also reflecting on what you *don’t* want from what you see around the gym floor. As examples, there are some physique traits aspired to inside the little bubble-world of a gym that I’m now completely comfortable with feeling indifferent towards: Sure, I’d like a bit more arm mass, but not at the cost of expanding my waistline; I’d rather be able to wear my slim-leg jeans than have gym rat-approved quads; I’d rather be able to button a normal collared shirt all the way up than have gym rat-approved traps and neck; And I don’t need the sort of core thickness required to be that guy who can deadlift amazing multiples of his body weight. 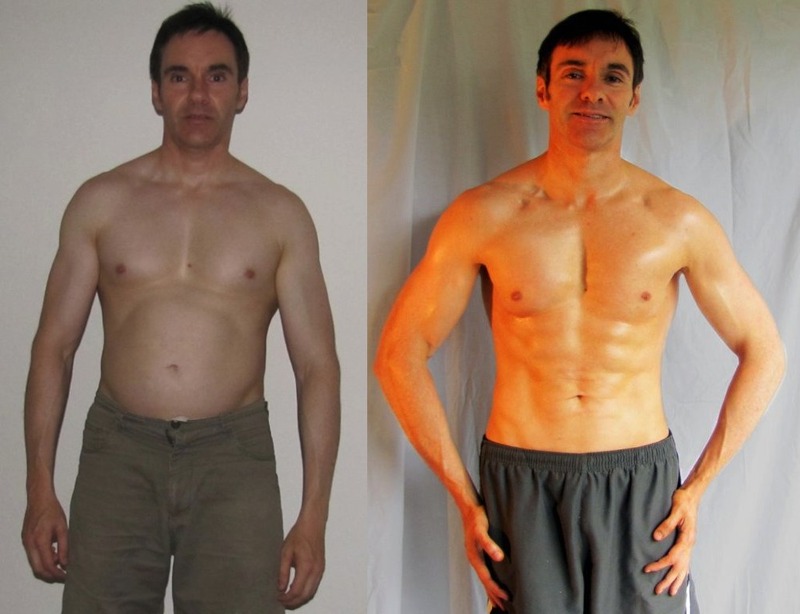 As a closing note of thanks to John and co – honestly, in my situation of having been a 5-7 day a week to the gym person anyway, and well accustomed to making all my own meals, the time and effort invested on this Adonis transformation mission over these however many months, and being a finalist in AT13, has already been paid back a dozen times over. Good luck to all the contestants in AT15 and beyond! Congrats on your placement in contest AT-13. I have seen you participate in our previous contests and I’m happy to see you have stuck to the Adonis Lifestyle journey. A Top 10 finish is a tremendous accomplishment and we look forward to your continued inspiration in the Adonis Community as well as future transformations from yourself.